Yowies are aguably the world’s most agile snowshoe. 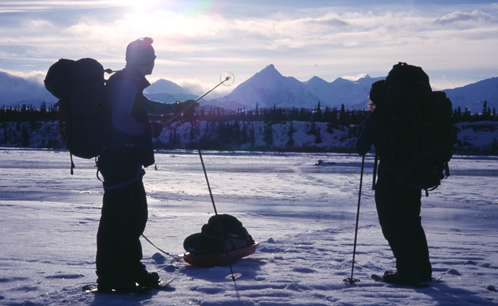 While traditional snowshoes have a rigid platform, Yowies have a flexible platform. This innovation allows the user a range of movement that is impossible in conventional snowshoes. Yowie snowshoes are unique because the entire deck is flexible. The dual harness system keeps the snowshoe snug against the toe and heel of your foot. Being flexible, you can walk normally, this means anyone can use them. Since your whole foot is attached, they become part of your foot. You can walk backwards, sideways, around trees and up and down hills. Yowies come in two sizes - medium and large. The adjustable dual harness ensures that each size fits a range of boot sizes. There are two important factors to consider when determining the correct size Yowie. US-10 boot size is the typical minimum for the Large Yowie. It is important, that the boot not be too small as the toe strap may slip forward over the boot toe. Height can be linked to boot size - smaller person smaller foot - bigger person bigger foot. We have found that people taller than 5’11” begin to prefer the Large Yowie. A person less than 5’10” may find the size of the Large Yowie platform awkward and difficult to use. Selection of Yowie size is usually only a concern when a person of average to small height/boot-size is considering the Large Yowie instead of the correct Medium design. For example, wish to use in powder snow with a heavy pack. Yowies are a medium size snowshoe, not a powder snowshoe. Interestingly modern snowshoes have developed to become smaller in size with the need for better manoeuvrability and ease of use. Under most conditions at surprisingly minimal expense to flotation. Consider your priorities, should manoeuvrability be an important requirement, please consider Yowie: arguably the most agile snowshoe on the planet. Yes. This is one of the key design features of Yowies. The strength of the platform and secure harness allows you to kick steps up an extremely steep slope, just like you would in boots. The same technique can be used when descending, there is no long tail to interfere. Keeping your foot horizontal not only ensures a stronger hold, it helps to make the walking action natural. the professional’s choice - relied upon by adventurers worldwide.